Mineral rich compost is the end product of organic matter decomposition. Organic matter can include: garden waste, kitchen scraps, manure, leaves, grass clippings and straw. When we create compost, we attempt to duplicate the decomposition process that occurs naturally. For example leaves fall from the top of trees in our forests, land on the ground, then slowly decompose through microbial action. 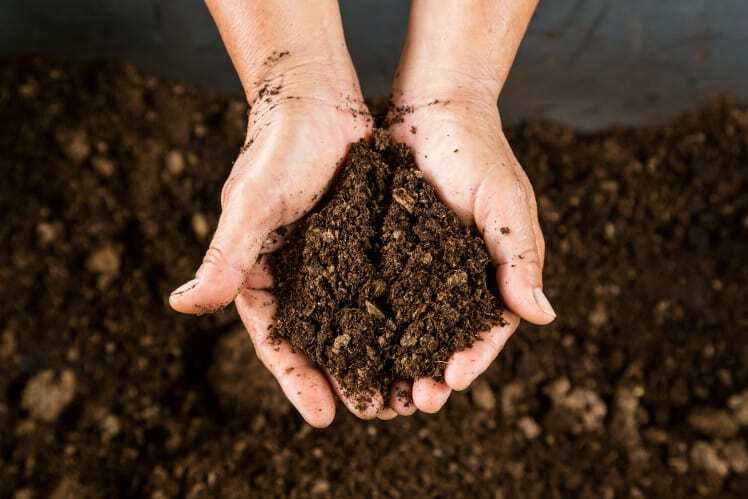 Compost is a living culture, a colony of macro and micro organisms that converts organic matter into humus. It is a valuable mixture of decaying organic matter that is used to improve soil structure by providing nutrients. 30 parts carbon to one part nitrogen. Accordingly, the ideal ratio of Carbon to Nitrogen (C:N) = 30 : 1 (measured on a dry weight basis). This ratio governs the speed at which the microbes decompose organic waste. Most organic materials do not have this ratio. In order to accelerate the composting process, it might be necessary to add carbon. The C:N ratio of materials can be calculated by as follows. Example, if you have two bags of cow manure (C:N = 20:1) and one bag of corn stalks (C:N = 60:1) then combined you have a C:N ration of (20:1 + 20:1 + 60:1)/3 = (100:1)/3 = 33:1. Carbon is food for micro-organisms and a simple way to add carbon is with cane sugar or molasses. Micro-organisms also need nourishment in the form of minerals and trace elements in order for their populations to expand and increase the speed of the decomposition process. It has been demonstrated that the incorporation of SEA-90 sea mineral solids into compost at the following rates increases the microbial populations and speeds up the finishing process by as much as seven weeks. Mix evenly into the compost pile one time. Dissolve one lb SEA-90 per five gallons water and spray on each 12 inch layer. 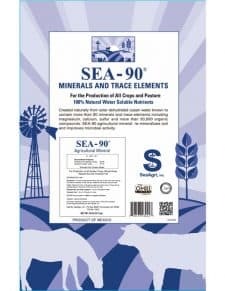 50 lbs SEA-90 per 40L x 6W x 4H wind row mix. Temperature is directly proportional to the biological activity within the composting system. Generally, composting begins at mesophilic temperatures of 37-44° C (98-112° F), and progresses into the thermophilic range of 45-80° C (113-176° F). Maintaining a temperature of 54° C (130° F) for three to four days favors the destruction of weed seeds, fly larvae and plant pathogens. At a temperature of 155° F, organic matter will decompose about twice as fast as at 130° F. Temperatures above 68° C (155° F) may result in the destruction of certain microbe populations causing the temperature to rapidly decline. Temperature will slowly rise again as the microbe population regenerates. In later stages, other organisms including actinomycetes, centipedes, millipedes, fungi, sowbugs, spiders and earthworms assist in the process. As the metabolic rate of the microbes accelerate, temperatures within the system increase. Conversely, as the metabolic rate of the microbes decrease, the system temperature decreases. Moisture content, oxygen availability, and microbial activity all influence temperature. Composting microorganisms thrive in moist conditions. For optimum performance, moisture content within the composting environment should be maintained at 45 percent. Too much water can cause the compost pile to go anaerobic and emit obnoxious odors. Too little will prevent the microorganisms from propagating. When moisture is correct and the pile temperature is increasing, it is operating at optimum performance and should not be disturbed. As the temperature peaks and begins to decrease, the pile should be turned to incorporate SEA-90 and oxygen into the compost. Subsequently, the micro-organism populations rebound and temperatures should again cycle upwards. The turning process should be continued until the compost is biologically stable and has the appearance of top soil.